The CW Supernatural panel was a huge draw on the final day of the 2018 San Diego Comic Con. The Supernatural cast can always be counted on to conduct a fun Q&A, and they always help finish up the Comic Con weekend on a high note. This year’s group of Supernatural stars included Jared Padalecki, Jensen Ackles, Misha Collins, and Comic Con newbie Alexander Calvert. In addition to the panel, the group also participated in roundtable interviews to further delve into what fans can expect when season 14 kicks off on October 11, 2018. Misha Collins did a terrific job of withholding spoilers while discussing what’s in store for Castiel in the new season. 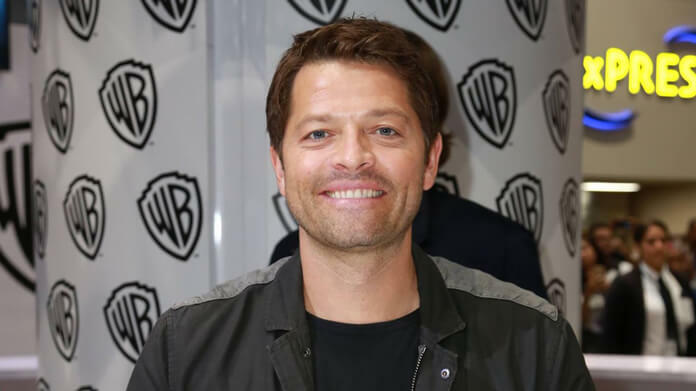 Here’s what everyone’s favorite angel had to say about season 14, returning guest stars, and Cas and Jack’s relationship. In season 13 Naomi gave Castiel the bad news that Heaven will cease to exist unless he’s able to find Gabriel. Will he try and help since he’s one of the last remaining angels? What can you say about Cas’ relationship with Jack in season 14? Misha Collins: “I think Jack has sort of had this idea of Cas. In that first year he really didn’t spend much time with Cas. But Cas for him sort of took on a bit of a mythological quality as his sort of would-be adopted father or caretaker or guardian angel. And, so, this is really I think our first time where we get to really flush that relationship out at all. What does that look like at the beginning of the season? What are the first steps that you take? Will this be resolved quickly or will it last a bit longer through the season? What will happen now that there’s this larger group of people who’ll be working together? What’s the dynamic among the group? How does Cas fit into that? Misha Collins: “He’s the biggest gossip of everybody. I think it’s an interesting place to find ourselves. It hasn’t been typical in Supernatural for us to have such a big cast of known characters. Typically, it’s like two or three core characters and then guest stars who come and go. Now we’ve got a lot of characters that the audience knows well who are alive again and are getting to sort of play out… We’re getting to work with characters that we already know and the nice thing about that is you don’t have to introduce the character and get to know them and figure out what their idiosyncrasies are. You can sort of start with a given entity, and I think that that allows us to play with the storyline in a little bit of a different way. What will be the differences in approaching the problem between Cas and Sam?